I’ve previously talked about how I save too many articles to read later and questioned whether bookmarking pages is still a thing. Basically, I have trouble laying my hands back on great content after stumbling upon it the first time. Clearly, I’m not alone: the team behind Refind has built an app that lets you save articles and resources and highlights those items in search results when you Google keywords related to them. Refind offers a more natural way of finding something you’ve previously come across and it even works for things you wouldn’t save to a read-later app like Pocket, such as a Photoshop tutorial or a GIF resizing tool. After you’ve installed Refind’s extension for Chrome and you enter a search term in Google, any pages you’ve previously saved will display a little avatar below them. Naturally, you can also find all your saved links by visiting your own profile in Refind. But what’s also interesting is that all your saved pages are public. They go into a shared feed that then surfaces additional links that Refind thinks you’ll like, based on people and topics you follow. 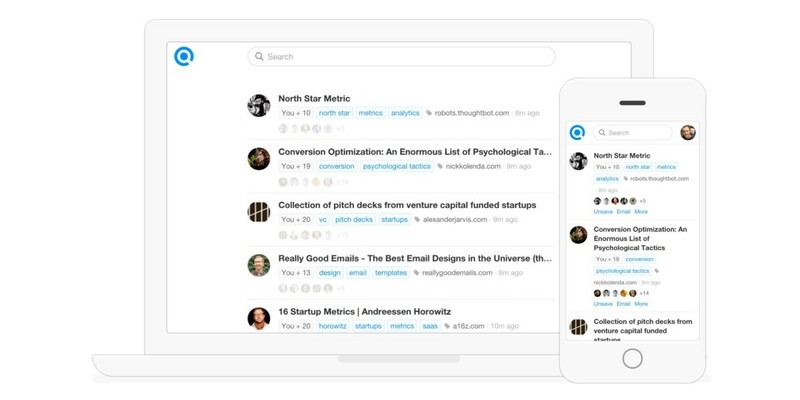 Refind’s sparse design language extends from its Web interface to its mobile apps. Functionality is minimal too: there’s not much to do besides saving, tagging and sharing links. The company hopes to build a community of startup founders, developers and designers around its app. It’s still early days and by announcing its news in places like Product Hunt and Hacker News, it’s managed to quickly gather exactly that sort of crowd. It works well if you’re into that sort of thing, but it’ll be interesitng to see how Refind matures to either grow its tech-focused community or open up to other interests as well. The team behind it has shared ideas about how it’s meant to be complementary to other tools like Evernote and Pocket, but people will find their own ways of integrating various apps into their lives. I’ve a feeling that the community aspect is what will define Refind’s success — not its functionality. If you’re already comfortable saving and retrieving valuable content, Refind might feel like overkill. But if you’re looking to share and discover ideas and tools with geeks, it’s certainly worth a look.